Part of the fun of visiting Cape Cod's beaches is combing the sand for shells. Keen and casual collectors of all ages never know what the tide will bring to the water's edge. So what are the shells you are likely to find while exploring beaches on Cape Cod? Keep an eye out for these shells, perfect for your collection. Jingle shells are beautiful, golden shells that are great for collecting using in jewelry and art projects. Scallop shells are another shell that is native to the area that come in all sizes, from little baby shells to bigger ones. Scallop shells can also be nice for art projects and making Christmas Ornaments. 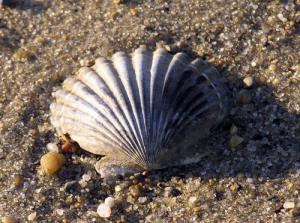 Bay scallop shells are more likley to be found on Cape Cod beaches, although sea scallop shells do turn up. A less common find is a whelk shell. These are bigger shells that can be nice for adding to home decor, especially at your Cape Cod home. Moon shells are small and beautiful. You can add them to vases with sand and other shells to create nice decorations for your home. Quahog shells and clam shells are a common sight on Cape Cod beaches and they generally will have spots of deep purple, known as "wampum". Razor clam shells are also a common sight on Cape Cod beaches, but unlike most of the above shells, they are not the most beautiful of shells, but they can be a nice find none-the-less for an avid collector. Angel wing clam shells can also be spotted on Cape Cod beaches, but are not as common as the other shells listed. They are pretty and can make nice additions to home decor and art. Cockle shells aren't only found in rhymes about Mary Mary Quite Contrary; they are also found on the shores of Cape Cod, so keep your eyes peeled for these little gems which can look nice in vases. Mussel shells are a common sight on Cape Cod beaches and many have an enchanting iridescence that works well for art and jewelry. Oyster shells aren't only found at the Wellfleet Oyster Fest, they are also found on the area beaches. Slipper shells (known by some as "boat shells") are another common find on Cape Cod beaches. These shells add well to home decor by decorating picture frames or adding to vases with sand. Sand dollars aren't the most common of finds, but they do show up on Cape Cod's shores, so keep your eyes peeled. Sand dollars can be great decor items, used for art, or used to make ornaments. Sea stars (or starfish) aren't actually shells but are still a fun find that can really help bring the feeling of the beach into your home. Horseshoe crab shells are another find, although they are usually a bit bulky for bringing home. Make sure they are empty before bringing one home with you! Fun tidbit? Horseshoe crabs aren't actually crabs; they are more closely related to spiders, scorpions, and other arachnids. Skate egg cases (mermaid's purse) are another find on beaches, although they do not travel well. Many different crab shells can be found on Cape Cod beaches as well, including blue crabs, fiddler crabs, spider crabs, green crabs (an invasive species), and purple marsh crabs. There is no shortage of shells to pickup for an art project or a little remembrance of your Cape Cod vacation. Cover photo by Maggie Kulbokas. Article photo by John Fitts.